Where I currently work we have licensed rights to various universities and colleges. Recently we had to make a tough decision: do we keep UCONN or let it go? Since the company I work for is located in Connecticut, it would seem logical to keep the school’s licensing rights but they are restricting the new logo’s usage to a select few. So far, I’ve only seen that Nike and Duncan Donuts are allowed to use the new logo. If you look in the specs above, it says UConn will “announce it’s future marks and their availability to licensees” in early winter/spring. Of course, early winter/spring meant May 1st, a full two weeks after they revealed the logos to the general public. Just my opinion here, but doesn’t UConn value their licensees more than this – that they get this info after the public gets it? Then to see that unless you’re willing to cough up big bucks, you can’t have it until 2014! 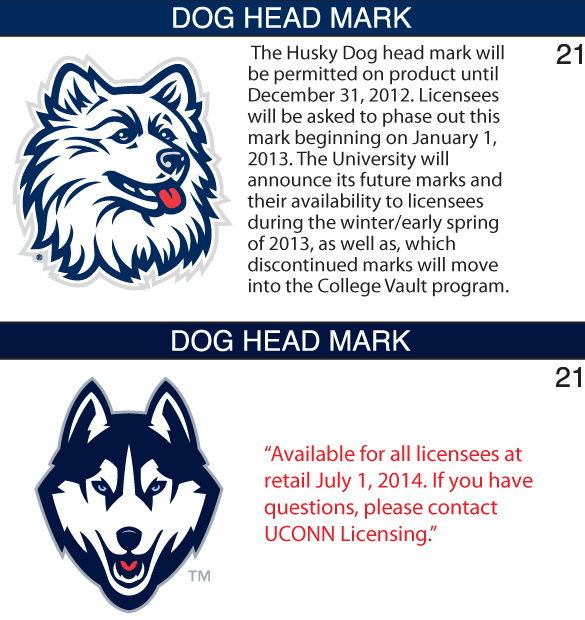 So that means for the small businesses, they don’t get a mascot logo from UConn for one year and a half! Since the company I work for makes items for women, the logo that was most popular was the mascot, not the lettering. So without the rights to use it, the best option was to cancel the license for now, and maybe pick it up again in the future. Too Bad.